On Saturday morning I awoke in a tangle of bedsheets with frost clinging to the window frame. The flat was silent, my toes creeping along the wooden floors the only noise as I found some cosy slippers and flicked the kettle on to boil. Hands cradling a decaf coffee, I buried myself back under the covers to warm up. My day stretched ahead of me, my weekend empty. I was alone in the flat with my time to use as selfishly as I wanted. I could take myself out to brunch, see the Christmas market in town, walk around the park surrounded by dying leaves. But I knew I really just wanted to bake a pie. The simplest things in life can really bring you more joy than you realise, especially when you have neglected them. I filled the stereo speakers with Laura Marling, Regina Spektor and Bombay Bicycle Club and set to work with my hands, rolling and tucking and layering and plaiting pie dough. Apples sharp and crisp peeled and sliced for tossing with spices and sugar. A caramel made with the spiced apple juices. The smell of a freshly baked pie, edges crisp and lattice flakey pulled from the oven and dusted with a puff of icing sugar snow. My greedy hands ate a slice too quickly, caramel starting to pour from the not-quite set pie. But I was allowed. I was on my own and I could do as I pleased. I’ve been thinking a lot about company recently, both too much of it and not enough. I’m surprised at how other people make me feel like myself whereas a weekend of my own company seems daunting, like spending time with a stranger. I used to know her so very well and yet it felt rather brave to be completely in my own company for a while to reset. But while my weekend was a luxury I did not know I needed, I also walked to the post office to send a parcel of Nutella brownies to someone who could use a little comfort. That’s what baking brings me, a chance to lose myself arranging a lattice and listening to music on my own while also brightening someone else’s day with a box of homemade goodness. As the holidays begin to creep up on us, it’s worth remembering to take a little time out for yourself, but to also be there for those who could use a little company. To make the pie crust, put the flour, sugar and salt in a bowl and mix together before adding the butter. Using your fingertips, break down the butter into chunks, as though you were making shortcrust pastry. Don’t rub in the butter too fine, you want the mix to be textured - some bits of butter rubbed in finely with other larger pea sized pieces. Once roughly combined, stir through the buttermilk or homemade buttermilk with a knife and bring together with your hands, adding a little flour if it feels too sticky. Divide into two and wrap in clingfilm and place in the fridge to rest for at least one hour - I made mine the night before to save time, bringing the pastry out the fridge around 20 minutes before rolling out. 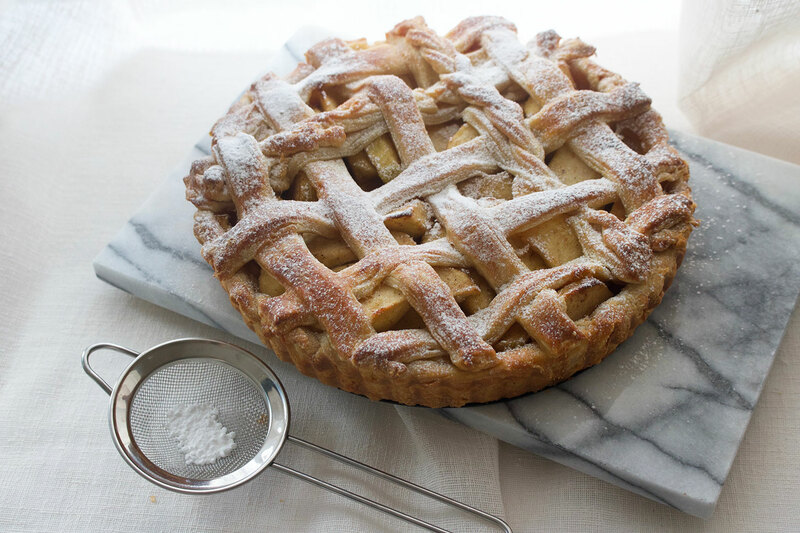 Once you are ready to make the pie, dust a clean work surface with flour and roll out one half of the pastry into a large circle slightly bigger than your pie tin. I used a 23cm tart tin and this worked fine. Once rolled, carefully lift the pastry into the tin and press down lightly into the corners. Fold the edges outward but inside the tin to create a rounded top, then place the pie in the fridge while you make the filling. Peel the apples, core them, then slice fairly thinly and place into a bowl. Add the lemon juice, sugars, spices and salt, mixing together well before adding to a sieve set over a bowl to catch the juices for the spiced caramel. Leave for at least 20 minutes. Pour the strained spiced apple juice in a small saucepan with the butter and place over a medium heat. Let the mixture bubble and reduce for around 3 to 5 minutes - once it is bubbling furiously, remove from the heat. Place the apples back in the bowl and cover with the spiced caramel, stirring together. Preheat the oven to 200oc/180oc fan as you assemble the pie. Pour the caramel apples into the pie crust and level off with a spoon then place to one side as you make the lattice. Roll out the second pastry disc as before, cutting into 10 equal strips longer than your pie. To make the lattice, I followed the tutorial linked above then made two plaits with the leftover pastry scraps. Brush the lattice and the edges of the pie with the egg wash then place on a baking sheet and bake in the oven for 45 to 55 minutes until the pie crust is golden and crisp. Remove from the oven and leave to cool in the tin for at least an hour to let the juices settle. Dust with icing sugar and serve in slices with ice cream. 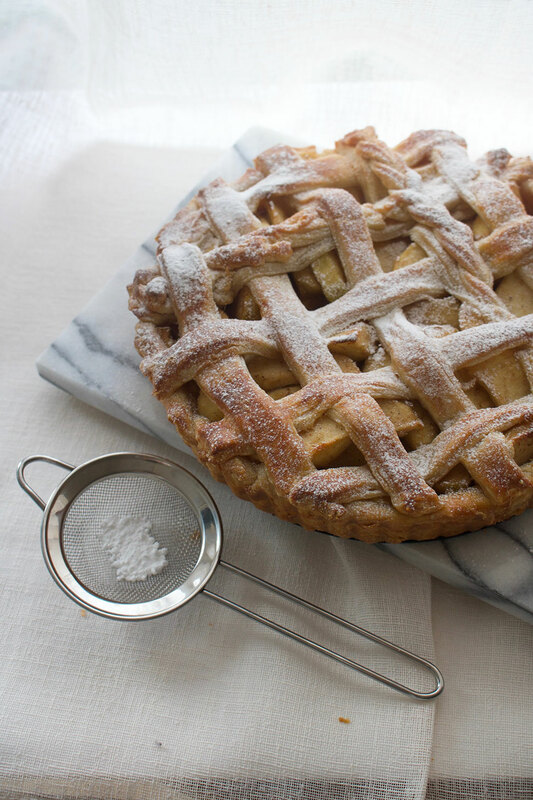 This is a gorgeous pie! 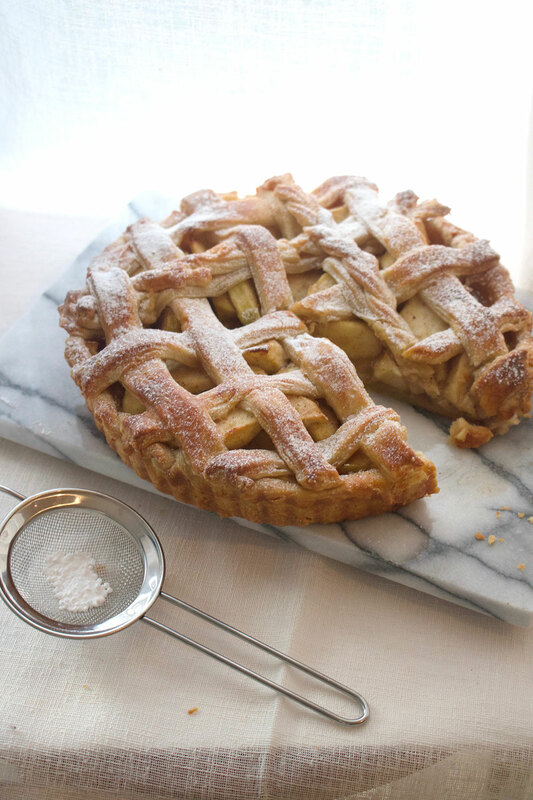 The lattice looks awesome, and that crust! So flaky! Thanks Caitlin, it’s such a festive smelling pie that fills your whole kitchen up with a gorgeous scent! 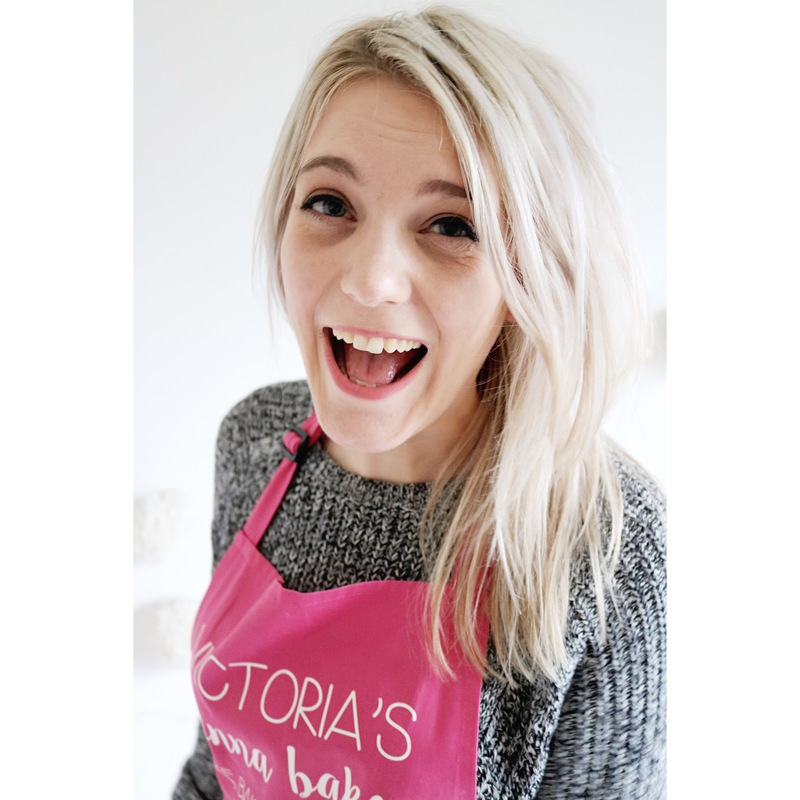 Please let me know if you give it a vegan twist, I’ve never made vegan pastry before! Hopefully it’s just as delicious as I’m thinking of doing Veganuary next year!